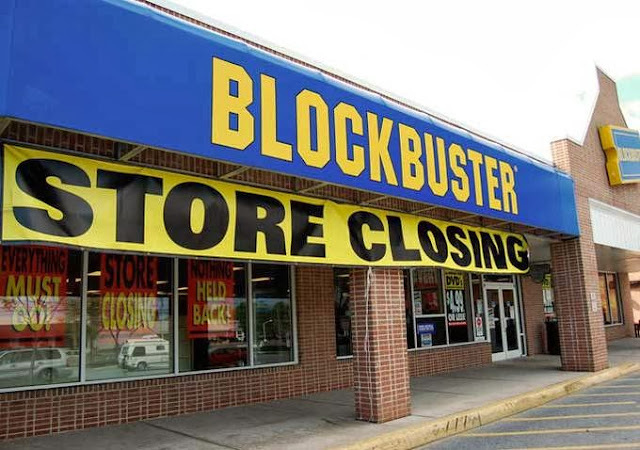 This morning it was announced that all of the Blockbusters that are still remaining in America will be closing down. As you probably know, my father owns the local Blockbuster in Dannevirke and I have worked there since 2007. Just like female film-makers are big in NZ (they really are, we're one of the most pro-feminist countries out apparently), video stores are still in existence. Then again, our Blockbuster is one of only 5-ish left in the country, with quite a few Video Ezy's and Civic Videos and United Videos scattered throughout the country (in our neighbouring city, there are three video stores in the same area, it is crazy). Alas, things aren't the way they were when Blockbuster first came into my life in 2006. Videos were slowly filtered off the New Release wall. We got preview discs for all of the latest big films like Knocked Up and Superbad, but now only manage to get bottom of the range previews that likely have Billy Zane in them. We had the introduction of the HD and Blu-Ray sets, with St. Trinian's being the first ever movie we got on Blu-Ray. A shop that had thousands of DVDs with shelves that covered the entire store turned into a few measly shelves. 3D came around. People stopped caring about catalogue titles and would only go for the latest Dwayne Johnson film. The prices on the DVDs dropped. The revenue dropped. Now this shop is something similar to a cheap convenience store with 150 different types of lollies, music equipment and Hen's Party gear. I make no secret of the fact that I'm absolutely livid at how the shop has turned out. And in no way do I attribute this to the demise of video stores. One of my favourite depressing things to do is look at all of these classic movies - most recently, going through Daniel Day-Lewis' back catalogue to see how I could feed my feels - and see how they all got sold off in 2009/2010. When I was about 12, I used to love going into the shop to pick up real classics like Touch of Evil and all of Hitchcock's films, but then I specifically remember this day when they sifted through the catalogue titles and sold all of "the old ones". Films like A Clockwork Orange and Carrie gone because they were too old. And here's a wonder for you: we don't have Forrest Gump in store, sold purely because it didn't rent in six months. Six months isn't a long time. Alas, now we have a very small back catalogue, and now our new release numbers are dwindling...all to make room for the other business ventures. Things were good back in 2008 and 2009. We'd get 20 copies of a film like Taken, and have to run down to the Warehouse to buy more so we could keep up with demand. Now we struggle to have a 'feature title' (e.g. The Great Gatsby, Fast and Furious 6 etc) all out on rent at once. The Blockbuster franchise ditched us and left us to fend for ourselves - which was kind of good, since in 2008 they had a dispute with Roadshow that caused Roadshow to charge us $90 for a single DVD of a film like Miss Pettigrew Lives for a Day. However, while the business has been gradually declining, there's been a massive fall in the past year. I work a lot of long shifts in the weekend and let's just say, I can get my jobs done in an hour and use the five others to finish homework. This is partially because Dannevirke is failing on a whole (and boy I can't wait to get out of this derelict town), partially because we need it to be pouring down with rain so we can get people to rent movies, and partially because, well, DVDs aren't in demand any more. Just to be clear, New Zealand doesn't yet have a proper Netflix kind of service. We have a few wannabes, but our slow broadband speeds and such stop us from having what America has. Cinema in New Zealand is plagued by piracy. I swear my whole school has seen The Conjuring and it comes out on DVD later this week, and I can tell you that less than 25% of them would have gone to the cinema to see it. Why pay for something when you can get it for free? Why wait for something when you can get it early? In fact, the time between cinema and DVD is one of the things that customers complain about most. Four months is simply too long. I know that the distributors are probably trying to lengthen the life and relevance of their films, but I think three months is a better window. We can't drop our prices any more, but I think this is a small solution in an already down-and-out situation. After all, the DVD stores might be dead in America, but they're on life support in New Zealand. Despite the fact that our Blockbuster is on its way out, some cities have amazing and expansive stores, like Alice in Videoland in Christchurch which is literally a movie heaven. That place provides you with a movie experience, with every DVD known to man and vintage artwork adorning the walls. Then again, that's more of a nostalgia store. We've got to accept the fact that this is something dying a natural death: DVD stores are in their twilight years here, and it is only a matter of time before we get ultra-fast broadband and Netflix sets up base here. Yes, it is a sad fact that we can barely keep our doors open and our New Release numbers have dissipated rapidly (one copy of Before Midnight, which I fought tooth and nail to get). But please do not mistake the closure of Blockbusters and other video stores as the death of cinema. It is the death of plastic containers filled with discs. Just like videos disappeared, the stores that went with them will, but that's only because technology is advancing. And hopefully that keeps people firmly planted in the cinema, because after all, it was that advancing technology that gave us a film like Gravity, which has done pretty darn well for itself, hasn't it? The glass is still half full, so let's not let this whole thing knock the glass down. I actually thought about you when I read that Blockbuster is closing it's remaining stores. Even though I'm guilty of choosing Netflix over my local video rental stores, it still makes me a little sad to see them go. I know I have to wait a little longer for Netflix to get a new release, but its just so much cheaper to do it that way. We don't have anything like Netflix here, which is definitely helping us survive. Once we get better broadband, though, we'll be so gone! Which is fair enough, DVD stores are a bit expensive and out of the way! Hi Stevee! Interesting to hear from an 'insider' as you used to work in one. I don't necessarily miss going to a brick & mortar store as it's just not convenient, but still it's kind of sad to see them go. Technology changes so rapidly that it's kind of inevitable. Same w/ those grocery store clerks getting replaced by auto-check out machines! Funnily enough, we just got those auto check out machines at our local supermarket. Kind of scary stuff! This article made me sadder than a lot of the "death of Blockbuster" articles. I think it's the personal perspective that you bring from having seen the impact on the video store you know so well. I still finding watching movies on DVD or Blu-ray at home much easier than streaming, but I know that I'm in the minority. We still have some video stores here, but I expect it will only be a matter of time before they're gone. I prefer DVDs and Blu-Ray too :( yes, they're dropping off quite quickly. It is rather scary! Excellent write-up! I miss Blockbuster, but availability has come a long way with online content. New releases at Blockbuster used to be all gone if you didn't time it right. Now we have iTunes, Amazon Instant Video, Netflix, etc. It's more convenient, but I dread the demise of other video stores.